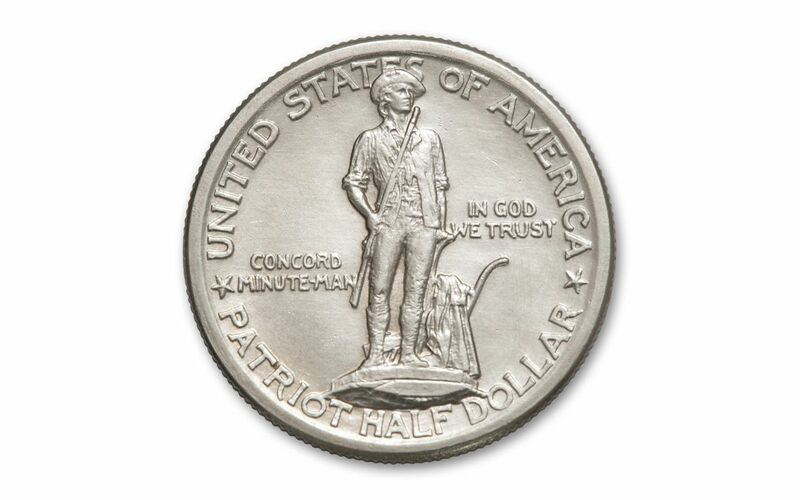 This highly coveted half dollar features “The Minuteman” on the obverse, a member of the self-trained colonial militia that would swiftly organize to hold off British advancement during the American Revolutionary War. Struck in 90% silver, this one-year-only commemorative coin was minted in 1925 to mark the 150th anniversary – the Sesquicentennial – of the battle of Lexington-Concord. The reverse features the Old Belfry located in Lexington – the site of the famous American victory. America’s history of one-year-only half-dollar commemoratives began in 1892 and lasted until 1954. Similar to today’s 50 State Quarters programs, these beautifully-designed silver commemoratives have long been popular with collectors for their scarcity and silver purity. Highly graded examples of the coins are becoming increasingly harder to find. Incredibly, the Lexington-Concord Sesquicentennial Commemoratives we have available are in crisp About Uncirculated (AU) condition – a remarkable condition to be in more than 90 years after its release! This coin is a must-have for any history buff, but with a very limited mintage of just over 162,000 there are far too few of these to go around. This is your chance to answer the call and add one of these spectacular coins to your roll call of beautiful coins! POPULAR ONE-YEAR-ONLY DESIGN – The design on this popular commemorative features sculptor Daniel Chester French’s famous Minuteman Statue located at the Old North Bridge in Concord, Massachusetts. 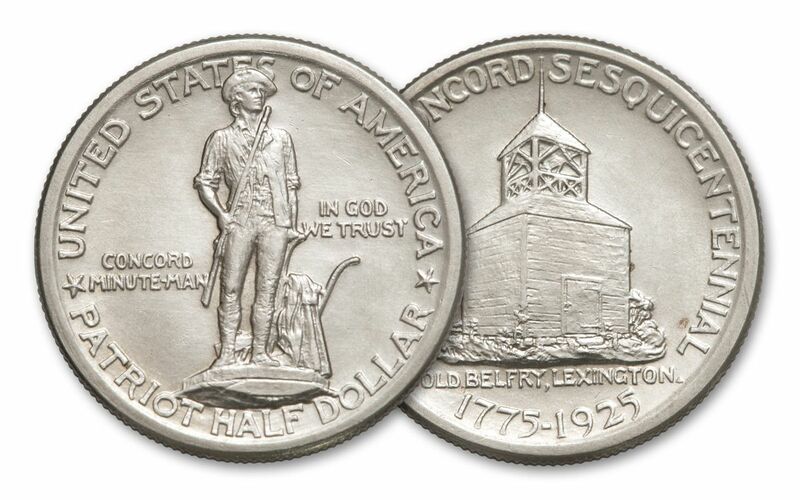 The coin’s reverse depicts the Old Belfry located on the Lexington Common where the alarm was sounded on April 19, 1775, calling the Minutemen to the Common. STRUCK IN FINE SILVER – These 1925-P 50 Cents Lexington-Concord Sesquicentennial Silver Commemoratives were struck in 90% silver. 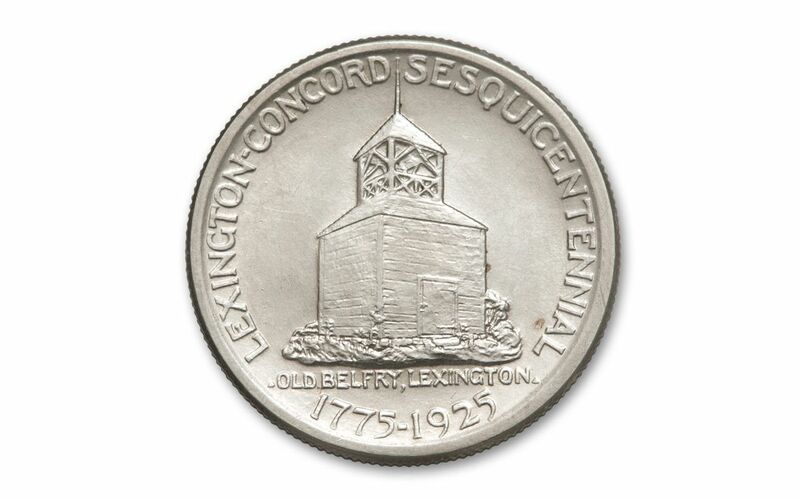 LEGAL TENDER COINAGE – Each Lexington-Concord Sesquicentennial Silver Commemorative is 50 cents legal tender. IMPRESSIVE ABOUT UNCIRCULATED CONDITION – Your 1925-P 50 Cents Lexington-Concord Sesquicentennial Silver Commemorative comes in nice About Uncirculated (AU) condition, nearly as crisp as the day it left the mint more than 90 years ago! LOW LIMITED MINTAGE – The U.S. Mint struck just 162,099 of these coins, with the coins in this offer all hailing from the Philadelphia Mint. Don’t let these Lexington-Concord Sesquicentennial Silver Commemoratives march off without you. Add one to your cart because they could be gone at any minute!